Special Offer. Buy 6 Bottles for £37.00 each. Single Bottle Price - £39.00. 11-14% of the blend is red wine. Red wine production is dependent on grape quality. The red wine undergoes 4 - 8 days maceration and is pumped 1 – 2 times per day. 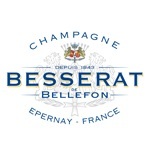 Besserat de Bellefon Cuvée des Moines presents the perfect champagne for any food focused outlet. Its softer style and lower pressure produce a style that is more akin to a fine white Burgundy with bubbles than regular champagnes. In 1930 the owner of Parisian restaurant "La Samaritaine de Luxe” challenged Victor Besserat to make a champagne that could be served with its food, right throughout a meal. Victor created the Besserat de Bellefon Cuvees des Moines and won the business. 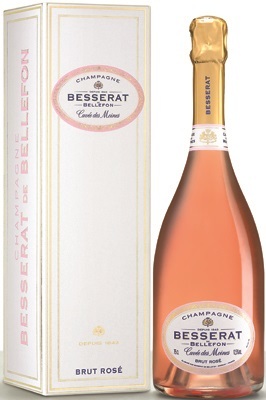 Made in the crémant style to a lower pressure with lower dosage to produce a wine with tiny bubbles, a very fine mousse and a creamier texture than other fizzes. Cremant Champagne creates a fresher taste and softer mouth feel with a delicate foam in the mouth which ends with a lingering aftertaste. Fast-forward to today and the Besserat de Bellefon Cuvée des Moines range is part of Lanson International UK’s portfolio and consists of five food-friendly fizzes.